It’s raining and my back hurts. I guess I’ll blog. But the little knitting that I have been doing has been creative! I test-knit a pattern for a friend, and I’ve come up with a simple design for a checkered heel and a stripey toe. Even though I only have one sock finished, I think you’ll get the idea about what’s happening. And I’m not the type of knitter to leave a sock unknit. I want to wear these! I used Brown Sheep Company’s Wildfoote Luxury Sock Yarn (75% Washable Wool/25% Nylon), color: Licorice. Love it! For the checkered heel, I grabbed some contrasting yarn and knit the first 2 heel flap rows, slipping every other stitch on the right side and just purling the wrong side. Then I changed back to the main color for the next two rows. The heel flap is about 28-32 rows long. At the point where I turned the heel, I used the main color only. For the stripey toe, on the decrease rows I changed to the contrasting yarn, and used the main color yarn for the other rows. Except I did the first decrease on needle 1, and then I started the contrasting yarn on (what I refer to as) needle 2, so that the woven-in-end wouldn’t be on the bottom of the sock. This made for a perfect end with the kitchenered main color. Wouldn’t it be fun to use up lots of crazy sock leftovers doing this? I think it adds a bit of charm. I have strong opinions about how to knit socks so they fit. First of all, I like for socks to have a slight “negative ease”. 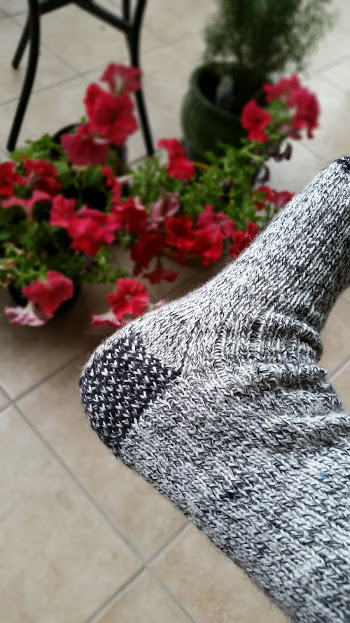 Negative ease means the socks will stretch to fit the feet, and that the socks look smaller than the feet when they’re not being worn. If socks are larger than the feet they’re intended for (called “positive ease”), they’ll be floppy and your shoes will “eat” your socks. 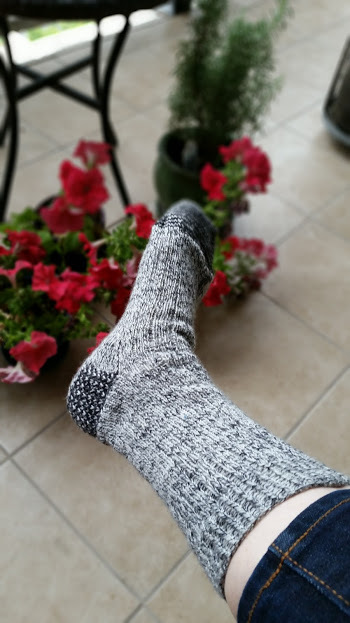 In my experience, socks with negative ease wear longer (or else my family is not hard on socks). About heels, the heel encompasses 50% of the leg stitches, and the heel flap should be square before turning, as in the above sock. If the heel is not long enough (too flattishly rectangular, if you will, instead of square) the leg will begin to sag, and you’ll forever be pulling your socks up, and that’s a pain. 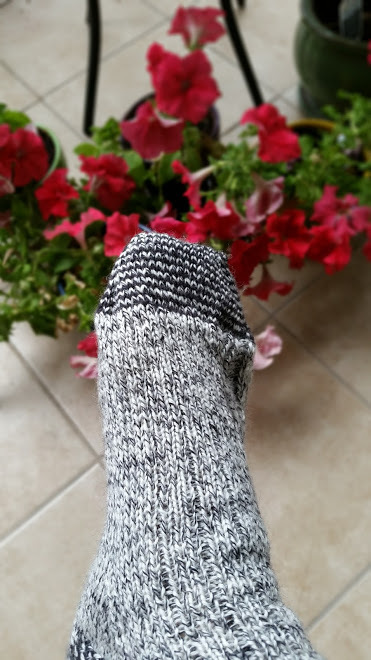 I’ve noticed that the short row heel (the one without a flap, as shown in the entrelac sock below) is not a very deep heel and tends to pull down the back of the sock leg. Had I been a better photographer, and laid the heel flat, it would look short and insubstantial. But they’re in my daughter’s dorm room and out of reach for a better photo!